The Best Seat in the House NPR coverage of The Best Seat in the House: How I Woke Up One Tuesday and Was Paralyzed for Life by Allen Rucker. News, author interviews, critics' picks and more. 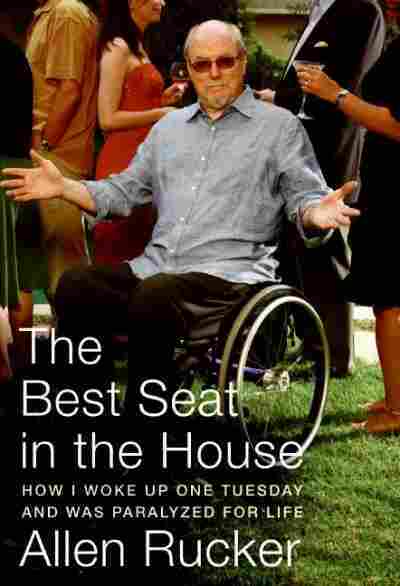 A personal, humor-tinged account by a man who was suddenly rendered a paraplegic by the rare condition transverse myelitis describes how his abruptly changed circumstances forced him to reevaluate his life and the larger questions of human existence. 25,000 first printing. Please don't get me wrong. Living with paralysis is not like the disease-of-the-week TV-movie in which the Robert Urich character, having wrestled his demons to the ground for two commercial-filled hours, bravely gets off the floor and Frankenstein-walks across the room while his wife weeps and prays in the corner. I wish it had worked out that way, but it didn't. Paralysis is an often painful and confusing process that takes way more than two hours to get a handle on, and unlike a TV potboiler, the outcome is always in doubt. Just when you think it's time to bring up the music and roll the credits after a small victory—boom!—something untoward happens and you're reeling again. Sometimes you're lost, sometimes you're not, but you're never quite out of the woods. Here is my life the day I became paralyzed. I was fifty-one, married with two sons, one in college and an eight-year-old at home, living in a big house in West Los Angeles, and pursuing my so-called craft as a writer of television specials and documentaries. I was at best an aging young Turk and at worst an aging journeyman, i.e., hack. I had made whatever mark I had made doing fringe television. First, in the 1970s, I was part of a guerrilla video group called TVTV (aka Top Value Television) which made satirical documentaries about public events like the Republican National Convention, the Super Bowl, and the weird seventies cult following of a fifteen-year-old Indian pop mystic named Guru Maharaj Ji. These shows were smart and well constructed and received a fair amount of critical acclaim. They didn't make any money, unfortunately, and the group broke up in 1977. My next fringe success was a series of cable shows starring Martin Mull called The History of White People in America. Done on a shoestring, like TVTV, and featuring an all-star comedy lineup—Fred Willard, Mary Kay Place, Harry Shearer, and Michael McKean, with Martin as the David Attenborough of whiteness—this quirky faux-documentary look at mayonnaise-eating midwestern WASPs won awards and spawned two books, a line of greeting cards, and a tribute from the Museum of Television and Radio. I thought White People was my ticket out of the showbiz ghetto, but I was mistaken. Before it had reached the commercial radar screen, it faded. It became a small-c "cult classic." But I did get my shot at the big Hollywood Lotto. With film director Amy Heckerling, I produced a television spin-off of Fast Times at Ridgemont High that lasted seven shows. I got my shot at writing and producing my own sitcom for HBO about working-class misfits starring Dwight Yoakam. (The pilot didn't quite work.) I got my shot at writing an original HBO movie called Hometown Boy Makes Good, a story of a guy who fakes medical school to please his small-town parents. (Anthony Edwards was great as the lead, but the movie disappeared without a trace.) I wrote other pilots and other movies, and they all went nowhere. By the early 1990s I had no career. I was just another schmuck in Hollywood, looking for any low-end assignment to pay the rent. "Write a tribute show about a campy old TV series I've never seen and couldn't care less about? Sure, I'll do that. Sounds like fun!" Actually, writing one-shot shows I didn't much care about gave me a new professional life. I started to bounce back as a "specials" guy. I wrote now-you-see-them-now-you-don't network specials, even some about campy old television series, like Brady Mania: A Very Brady Special. I wrote a music special about the 1970s and a nostalgic look back at All My Children. During the heyday of hard-hitting trash-reality fare, I helped write The World's Worst Drivers, Part Two (I had nothing to do with Part One). It wasn't the stuff of Peabody Awards, but I occupied a marginal niche in the Dream Factory. This eventually led to awards show writing, a strange form of literary harlotry—part comedy, part exposition, part shameless cant. The acclaimed television producer Don Mischer aptly described this job as the TV version of skywriting. People see it for a split second, then go back to sunning on the beach. It's the kind of writing where if you do it well, no one notices. If you do it poorly, then the third-tier TV actor reading your words for the first time off the TelePrompTer at the awards show will look out at 10 million people and say, "Hey, who wrote this crap?" At first it was fun making up silly comedy bits for freewheeling shows like the CableAce Awards, but a career of composing interstitial patter for splashy Hollywood ego fests is a career only a masochist could love. Struggling to come up with something clever beyond "Hubba-hubba, that is some dress!" or "Isn't this exciting? I can't wait to open this envelope!" for wit-challenged movie stars and then having their publicists give you comedy notes is like grabbing the short straw in the prison gang-bang sweepstakes. "You know, Phyllis doesn't think this copy is very funny and really wants to say something funny, so could you come up with something, you know, funny for her to say? Oh, and mention her new pantyhose commercial. Say something funny about that." My greatest humiliation in this field came the night of my first assignment writing the annual special the People's Choice Awards. First off, this is a crowd-pleasing show, but it's not the Oscars. As an incentive to get stars to show up and thank "all you wonderful people out there, real, God-fearing people, the only critics who really count," the producers tell the winners in advance that they've already won. On this particular night, ER was a big winner and Anthony Edwards was a presenter as well as a recipient. I had written something for him to say. I don't really remember what it was, but (1) it . . .